During each of my several visits to Yovi’s over the last few months, I’ve tried to ask at least one patron about this eatery serving Chicago-style hot dogs. The answers I received included: “You won’t be sorry you discovered this place.” “Never disappointing.” “About once a week, I walk past a dozen nice restaurants to have lunch here.” It’s not only the words folks use to describe Yovi’s, it’s the excitement in their voices when they get a chance to share their feelings about this little house of hot dogs located at 477 Greame Street in downtown Pittsburgh. Greame is a very short street connecting Market Square with Fifth Avenue. Lee Yovanof, the owner of Yovi’s, was born near Chicago and moved to Pittsburgh. He opened his first Yovi’s here in 1987 and closed it in 2006 to pursue other business interests. I remember walking up to the front door of the original Yovi’s shortly after it closed, feeling that a special place was gone forever. In 2012, he reopened this location just off Market Square near Graeme Street. Since 2012, this has been the place to get an authentic Chicago-style hot dog in Pittsburgh. The biggest change Lee made when he moved his operation from Chicago to Pittsburgh is to offer Heinz ketchup for his customers, who requested it for their french fries. Believe it or not, Hunt’s is the most popular ketchup in Chicago, though most Chicago people don’t put ketchup on hot dogs. While Lee serves other things besides hot dogs, I’m not sure folks would line up like this just for the “other things.” His Chicago-style hot dogs put him in a class all by himself. A few colleagues who saw the photo used here asked, “Where’s the hot dog?” If you look very carefully, you can see the ends of the dog beneath the garnishes. I could have moved stuff around so that more of the dog would be visible, but this is the way it was served, so that’s how we show it. 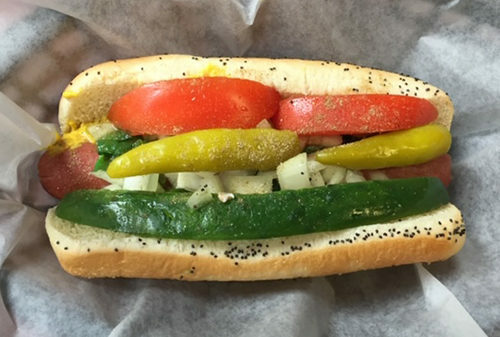 If you order a Chicago dog, you receive a Vienna beef dog on a steamed bun with relish, mustard, tomatoes, onions, peppers, and a pickle spear. Personally, I ask them to hold the peppers. As you walk down the steps to this eatery that might seat 40 to 50 diners, you’ll be greeted by an 8-foot photo of Chicago. On each side of this mural are 8 x10 inch prints of the Windy City’s sports heroes. The only photographic evidence I saw of a Pittsburgh influence was a small print of Mike Ditka wearing his Bears uniform with his number “88” and a larger print of Rick Sebak smiling with Lee. Can you imagine walking up to almost any fast food chain and asking a departing patron about his or her experience? Do you think you’ll hear, “Never disappointing”? I don’t think so. You do at Yovi’s!